I want to serve our traditional pork and sauerkraut on New Year’s Day, but my teenage daughter is discouraging me, saying she wants to start the year more healthfully. 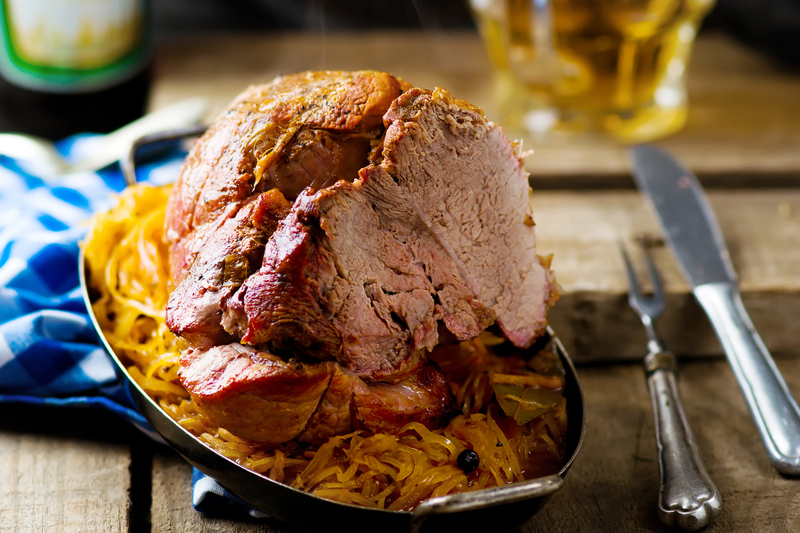 Is pork and sauerkraut not very healthy? Pork and sauerkraut — a small amount of sauerkraut, anyway — can star at the center of a perfectly healthful meal, so that’s no reason to do away with your edible New Year’s good luck charm. According to the Oxford Encyclopedia of Food and Drink in America, this Pennsylvania Dutch tradition stems from the idea that sauerkraut symbolizes wealth and pork signifies looking toward the future — because pigs root forward, compared with poultry that scratch backward. Whether or not the symbolism makes sense to you, the dish has become a staple on New Year’s Day in many households, especially in the Midwest. Today’s pork is much leaner than what your parents enjoyed. The Ohio Pork Council notes that fresh pork now has 16 percent less total fat and 27 percent less saturated fat than it did 20 years ago. The U.S. Department of Agriculture says a 3-ounce serving of roasted pork loin provides 165 calories, 25 grams of protein and just 7 grams of fat. Pork is also a very good source of thiamin and selenium and a good source of niacin and phosphorus. Be sure to cook pork thoroughly to an internal temperature of 145 degrees (use a meat thermometer) and let it sit for 3 minutes after removing it from the heat. That rest period allows pork to finish cooking and destroys any harmful bacteria, which could easily put a downer on your New Year’s festivities. Sauerkraut is low-calorie, but unfortunately it’s loaded with sodium. A half-cup of undrained canned sauerkraut has a whopping 780 milligrams of sodium, more than one-third of the upper recommended intake of 2,300 milligrams a day, and more than half of the 1,500 milligrams a day that people with high blood pressure should consume. Some types of sauerkraut have less sodium, so look at Nutrition Facts labels to compare. Also, you can significantly reduce sodium by draining the sauerkraut, and even more by rinsing it, before heating or eating it. But even then, keep portions to a reasonable size to keep sodium intake in check. Sauerkraut has also recently been touted for its health benefits as a fermented food, but it’s hard to tell how many probiotics — the healthy bacteria that boost your immune system and help synthesize vitamins — remain in store-bought sauerkraut after processing. Refrigerated types that haven’t been pasteurized or heated are your best bet (heat kills probiotics). In addition, acidic foods like sauerkraut lower the glycemic index of a meal, which reduces the chance of blood sugar spikes. To balance the meal, keep your pork and sauerkraut to reasonable portions, and load your plate up with other vegetables: some roasted sweet potatoes or acorn squash, and steamed green beans or snow peas. Add a fresh salad with dark leafy greens, chopped pepper and maybe even some blueberries and clementine segments — now that’s a way to start the New Year right. Chow Line is a service of the College of Food, Agricultural, and Environmental Sciences and its outreach and research arms, OSU Extension and the Ohio Agricultural Research and Development Center. Special notes: Chow Line is taking a two-week holiday break. And, this is the final column of Chow Line to be written by Martha Filipic. Look for a fresh perspective from writer Tracy Turner in the first column of 2017 on Jan. 6. In addition, beginning in 2017, we will no longer provide a PDF version of Chow Line. No worries, though: The column will still be available via email, on cfaes.osu.edu/news and on u.osu.edu/chowline.